You Thought They Were Just Trout! I’m going to try and enlighten a lot of people about the many species of the common name trout. I myself fished for many years with the common idea that trout were either Rainbow,Eastern Brook, Cutthroat and that was about it. Of course as I got older and had more access to books, I learned about more species, the Mackinaw, German Brown, and others I only read about but never saw yet, or fished for. I’ll take each species and give it blog space, telling what I know and have read up on. Maybe have some photos to. Please keep in mind that I’ll be researching this and a lot of the information will be quoted. I’m going to start with the more familiar to me the Cutthroat, which has many cousins of its own as your read. Another native that has been driven into head water sanctuaries, occupies less than 2 percent of its native range. Sporting vivid red and yellow coloration this native makes its home in the high country park lands amongst the aspen groves the state is famous for. This is a beautiful fish and a very picky eater. I was lucky enough to catch and release one. The fish that fed Lewis and Clark’s party as they crossed the northern Rockies is now relegated to 2.5% of its original range. The Westslope Cutthroat attacks anything that floats within eyesight of its lie making it highly susceptible to overfishing. The usual suspects have all played their parts in the decline. The creeks and rivers flowing out of the Bob Marshall Wilderness have stunning green water and kaleidoscope like rock bottoms. The rivers are like liquid glass and the blazing coloration of the Cutts are a spectacle to behold. Nature’s patterns are perfectly replicated in this fish as the color spectrum runs the gauntlet on this over sized West Slope. It is rare to see them get this large due to over fishing. This fish grows to very large sizes, due to the habitat and the nutrition suppl in the water. Roaming miles between ocean, estuary, river, and high mountain creek the Coastal Cutthroat is a nomad of the highest order. Following prey between habitats, this coastal denizen is the hardest trout species to track. The crystal clear waters of the Smith River make a perfect backdrop for this fish. With its torpedo like shape and leopard spotting the Coastal Cutthroat will pounce on anything that errs into its kill zone. This most aggressive of species preys on any available food items. I never dreamed there were this many different species. As I stated before I thought I knew most of the trout species and find out I’m not to smart. 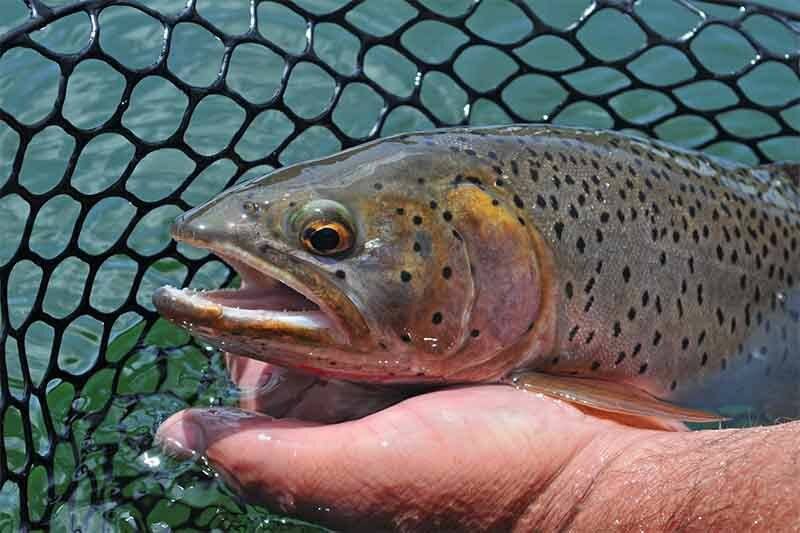 On this blog we will get acquainted with what they call non-native species of trout. Why they are called that there is not explanation. Where did they come from? We’ll start with the Rainbow trout which is found pretty much the entire continent, one type or another. They are a beautiful fish with like they are named have a rainbow colored strike going along their side, and large dark leopard spots over laying the silver base color. I should take a minute to explain some characteristics of these rainbow. I have found that geographical areas causes different pigmentation of these trout. When they are raised or live in cold water I find the colors are true to what I call rainbows. As we move to warmer climates the fish seem to bleach out on color, in streams where the water is very cold like in the high alps their color is just marvellous. There have been many times that I was overwhelmed by the beauty, I released the fish and had pancakes for breakfast instead. Now comes the wolfs of the deep. The German Brown with its torpedo shape and bullet head are predators and ferocious eaters and hard hitters. They like to stay deep after the hook up. Just a little story about my wife and I. We were still fishing and it had been a real slow hit day. I suggested we move to a place that I always had luck trolling around and by it. We Had just set the anchors and I glanced at my watch and told her we would give it an hour and call it a day. we baited up and made our casts and set the poles. She was looking over the lake and I noticed her line move, I told her to get her pole real fast, she just got her hands on it and it almost bent in half with the hit, she just barely saved her outfit. Please keep in mind we fish with very ultra light tackle, so we can’t just horse in a good fish. Well it took her 22 minutes to get the fish where she caught a glimpse of it, she almost exhausted all her reel line 3 times. Well, at 32 minutes she told me to take the pole she was to tired, I told her no way, catch her own fish. After about 5 times getting it to the boat it would take out another 25 to 60 feet of line, she just sat down and said she couldn’t do it any more, so I took the pole and set the drag up so it was a touch and go break off. Finally we got him in the net, it took 38 minutes to do it. But what a fish, just under 7 lbs, German Brown with teeth like a barracuda and tiger eyes to boot. They are an exciting fish. Now the Cutthroat trout, there are a lot of species or type here, I will just list them with a domain they reside in. I’ll start out by explaining what the main diet of this fish is. Its easy bugs bugs and flies. They are a fly fishers dream. Bait fishing you’d better be prepared to be very versatile and have lots of different offerings. I found that salmon eggs of different colors on a # 14 egg hook worked the best. The Green back Cutthroat-Rocky Mountain Range. There are many more types or named cutthroat, but I think you get the picture that the fish loves colder mountain water.